The latest data and analysis from Nationwide has revealed that during October annual house price growth slowed to 1.6% - a drop of 0.4% on the month and the lowest level since May 2013. Nationwide found that average house prices remained flat month-on-month after accounting for seasonal effects and overall housing market activity was still relatively subdued despite recent years seeing a recovery in first time buyer numbers. Robert Gardner, Nationwide's Chief Economist, said: “October saw a slowdown in annual house price growth to 1.6% from 2.0% in September. As a result, annual house price growth moved below the narrow range of c2-3% prevailing over the previous 12 months. However, this was broadly in line with our expectations, as the squeeze on household budgets and the uncertain economic outlook is likely to have dampened demand, even though borrowing costs remain low by historic standards and unemployment is at 40-year lows. We continue to expect house prices to rise by around 1% over the course of 2018. Looking further ahead, much will depend on how broader economic conditions evolve. If the uncertainty lifts in the months ahead, there is scope for activity to pick-up throughout next year. The squeeze on household incomes is already moderating and policymakers have signalled that interest rates are only expected to raise at a modest pace and to a limited extent in the years ahead. Housing market transactions remain relatively subdued, with little change in activity in recent years. There were 1.2 million transactions in the 12 months to September 2018, still 30% lower than the levels seen in the same period in 2007. There has, however, been a significant change in the pattern of housing transactions over the past decade. In the immediate aftermath of the financial crisis, cash transactions proved more resilient. This is because cash buyers were less impacted by the tightening in credit conditions and the deterioration in labour market conditions, which reduced the number of people able to buy with a mortgage. Recent years have seen a recovery in first time buyer transactions, which are now broadly in line with pre-crisis levels. The improvement in credit availability (including the introduction of schemes such as Help To Buy), historically low interest rates (in particular fixed rate deals), together with a steady improvement in labour market conditions in recent years have all helped boost activity. Meanwhile, mortgaged home mover activity has remained relatively subdued. This may in part relate to the demographic trends noted above, where more people moving transact in cash. 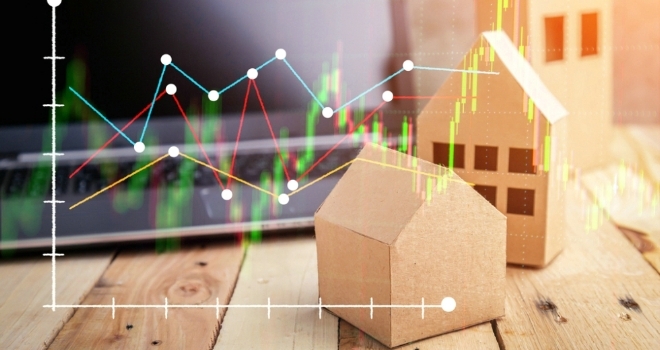 Mike Scott, chief property analyst at Yopa, comments: "October's house price index shows a renewed slowdown, with no change in prices for the month and the annual rate of increase falling to 1.6 per cent, its slowest in more than five years. However, with two months to go it remains significantly ahead of Nationwide’s 1 per cent forecast for the year. Nationwide provides some interesting figures on structural changes in the housing market. The total number of house sales remains well down on its 2007 peak, before the credit crunch. However, the numbers of cash buyers and first-time buyers have recovered to similar levels to those seen during the boom, while the number of buy-to-let purchases was recovering well until 2015, after which the government started to use the tax system to stack the cards against buy-to-let investors and the number crashed to about a third of the 2007 level. The big drop is in the number of home movers buying with a mortgage, which is still running at barely half of its level before the boom, and suggests that the rungs on the housing ladder have moved so far apart that many people are now unable to climb it. The subdued increases in real earnings since 2007 are probably the main reason, since many people who bought over the past decade will have seen little or no increase in their wages, and so will be unable to afford to move on to a larger home. Recent signs of wage growth are more encouraging, and a few years of above-inflation wage increases should help to unlock this critical section of the housing market." Jeremy Leaf, north London estate agent and a former RICS residential chairman, had this to say: "After a drop in house prices last month the trend appears to be continuing with a shortage of supply not managing to keep values up sufficiently. In a fragile market, bad news tends to have a disproportionately negative impact and much of this is down to nervous anticipation of what was in the Chancellor’s red case. However, the Budget could have caused more damage and we expect to see more balance but no fireworks in the period leading up to Christmas, which is traditionally quiet for the housing market. The difficulty remains that economic and political uncertainty is clouding judgements at a time when the economy is really not in apparently bad shape. The one bit of good news is that first-time buyers are taking the place of investors which will bring some welcome good news particularly if sellers recognise the importance of negotiation." Mark Harris, chief executive of mortgage broker SPF Private Clients, adds: "These figures show that first-time buyer numbers continue to rise, even as other parts of the market slow down. This is largely down to government schemes such as Help to Buy, lenders prepared to offer great rates at high loan-to-values and the fall away of buy-to-let investors. It is encouraging as first-time buyers are essential to the overall health of the housing market. Swap rates have fallen recently and we wait to see whether this will be passed on by lenders in the form of cheaper mortgage rates. Regardless, mortgages continue to be competitive as lenders compete for business in the run up to the end of the year."